Ireland's national television channel RTE's coverage of the World Cup provides a model that American sports broadcasters should emulate. Actually, I'm not even talking about watching the actual games, although RTE does a fair job on that. I'm talking about the pre-game, half-time and post-game analysis and discussion of each World Cup match. The World Cup draws a massive audience, including many people who don't watch a lot of soccer. Yet unlike what seems too common on American tv, RTE doesn't dumb down the coverage to meet the limited understanding of the game that some of the less devoted soccer fans might want or need. There's no razzmatazz in RTE's production. A panel of two or three analysts and a director of the conversation sitting around a big table discussing tactics, performances and using nothing more technologically adventurous than instant replay. The analysts are all unsentimental, intelligent, and opinionated, unafraid to go against the views of the mob or each other. Even their personalities seem like a slap across the face to an American sports fan used to fake smiles and/or "characters" among our analysts. 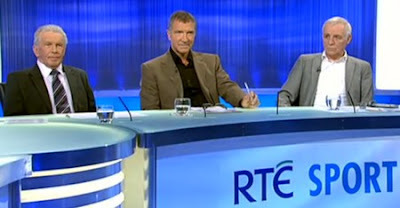 RTE's panelists range from clinical (Johnny Giles or Ronnie Whelan) to grumpy (Eamonn Dunphy) to dour (Liam Brady or Graeme Souness). For this World Cup RTE has worked in ex-German player Dietmar Hamann who has fit in well. If you're a serious sports fan who'd like to understand soccer more, RTE's panel offers a university education. However, if you're a long-time knowledgeable fan of the game, you'll find plenty of food for thought. It's exactly what any sports fan wants from the broadcaster during a major sporting event.